What is it? A bluffing game in which players are split into 2 teams randomly - villagers (humans) vs werewolves. Correctly vote which player is a werewolf, and the humans win. If you pick the wrong player, the werewolves claim victory. Always there have been opposing forces throughout history that have embodied the epic theme of Good against Evil. Axis vs Allies. Batman v Superman (too soon). And, Villagers vs Werewolves. The game Mafia has its origins in 1980s Russia as part of a student’s psychology research (a werewolf theme was later introduced in the late 90s). Players are secretly given one of two roles at the start of the game – either a member of the mafia (knowing full well the identities of your mafia colleagues), or you are an innocent, armed only with the knowledge of how many mafia members there were, and you had to work with other players to deduce who those members were. The game consists of a “night” phase, where the mafia players secretly vote to kill of an “innocent”. Thereafter a “day” phase occurred in which the surviving “innocent” players vote to kill off a suspected werewolf. Play continues until the mafia is entirely killed off, or until the mafia outnumbers the innocents. These games were run by a moderator. 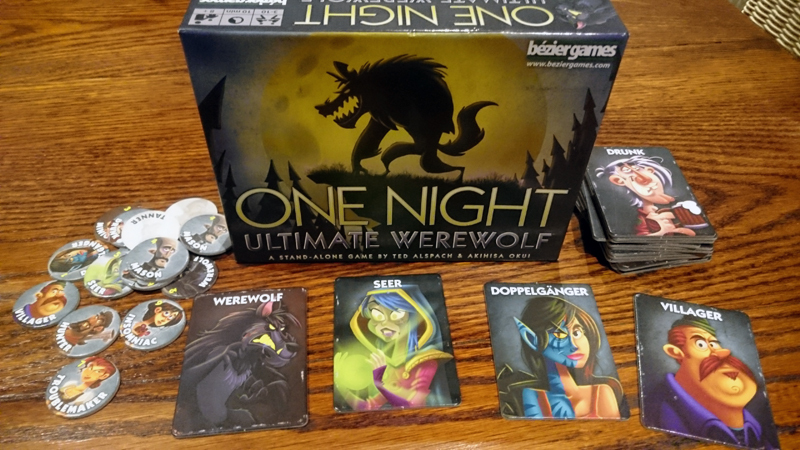 In 2014, One Night Ultimate Werewolf was released by Bezier Games. It is based on the classic Mafia / Werewolf system, but with two major differences. Everything now occurs in one night phase, and also everybody gets to join in the fun now because there is no need for a human moderator – everything is explained and managed by a free app (you will find more information on the app lower down). Villager – These can consist of regular, run-of-the-mill villagers, OR, a villager with a special role, such as a Seer, a Troublemaker or a Robber. Essentially, if you’re not a Werewolf, then you’re a Villager. Werewolf – The default enemy. There are only two of these cards. After everybody has viewed their role for the upcoming round, each player puts their role tile upside down in front of themselves. A special “night” phase now takes place, with all players closing their eyes, and in turn performing tasks specific to the role you were assigned. These tasks range from simply doing nothing (a villager), to changing player role cards. The role you started the game with, is not necessarily the one you end it with. And the best part? You have no idea this has happened. After this, all players open their eyes, and the villagers attempt to find out if there is a werewolf in the group, and cast a vote to murder somebody in the group. By talking to each other, asking what each player’s roles were, you piece together a rough story of what happened during the night phase. You’ll take the circular round tokes and decide on which players to place them to remind you of who you think they are. And at the end, you take an educated guess as to who is a Werewolf. If a Werewolf is successfully eliminated, then the Villagers win. If there is a Werewolf present but it is not killed, then the Werewolf team wins. Please note that if your role changed somehow during the night phase, you have fully become that new role. 1-3 Villagers – Not terribly exciting, they have no role in the night phase. Plain villager is plain. 2 x Werewolves – Werewolves have different actions according to how many are present this round (it could range from none to two). If there is a single Werewolf, then that player gets to look at one of the tiles in the middle (handy information for when you want to bluff about your identity). If there are two Werewolves, they acknowledge each other’s presence, and must find a way to work together to cast suspicion on other players. 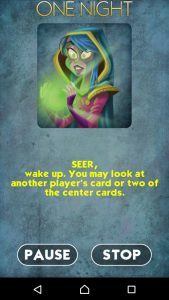 1 x Seer – One of the most important roles, the Seer can either look at another player’s card, or look at two cards in the middle. 1 x Troublemaker – This particular mischief maker swaps one player’s card with another, and does not look at the role cards. 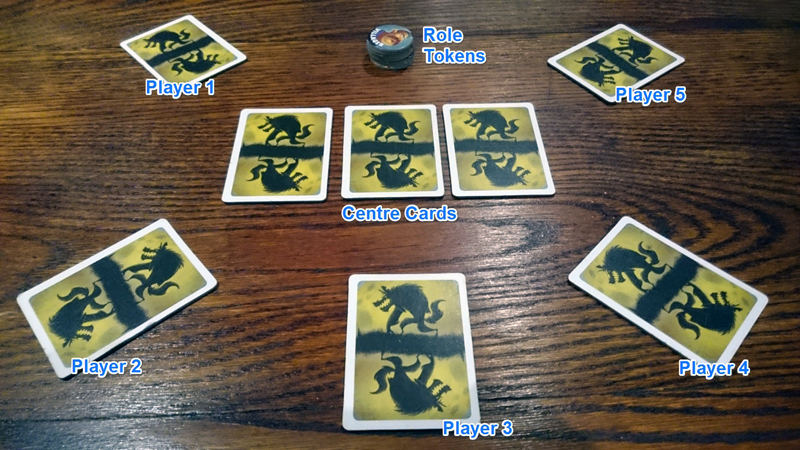 1 x Robber – The robber gets to trade his own role card with another players, and gets to view what his / her new card is. 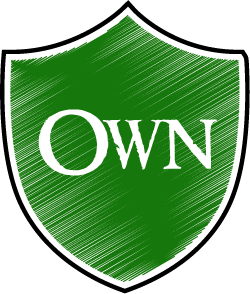 Your first few games will involve the above roles, it will give you a good understanding of how the game works. Though at the start you’ll find two to three players all claiming that they are plain villagers, and they did nothing. All lies I tell you. Time to make things more interesting, and force players to get more creative with their bluffing. Mason – There are two Masons, and both should always be included. They get to discover each other during the night phase, but have no other abilities. Drunk – The Drunk has no idea what’s going on. He gets to exchange his role card with one from the middle (but does not get to see his new role). Insomniac – The Insomniac wakes up, and gets to view his / her role card to see if it has changed. 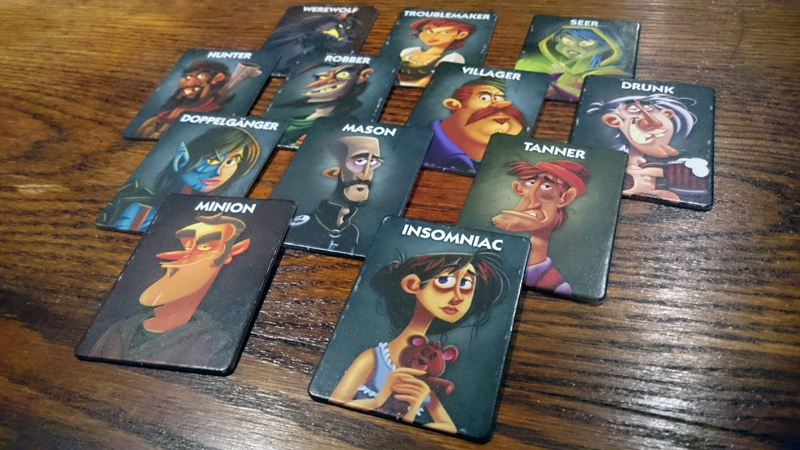 Doppelganger – You wake up, look at another player’s role card, and assume that exact role for the rest of the game. Yikes. The Minion – You know when I said earlier that if you’re not a Werewolf, then you are a villager? Well, here is an exception to that rule. 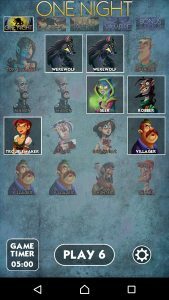 The Minion is on the Werewolf team, and learns during the night phase who the werewolves are (though they do not know who their minion is). If the minion is accused of being a werewolf, the werewolves will win because he has successfully distracted you from revealing a werewolf. Hunter – If a Hunter is killed off, the person the Hunter player voted for at the end, is also killed off. Tanner – The Tanner hates everything – his job, himself, his life – he basically wants to die. He only looks out for himself so he only wins when he dies. If only he gets killed off (and no Werewolves die), he wins the game, and only him. If he dies together with a Werewolf, then the Villagers all win. So, after the night phase is done, the real game starts. Players attempt to find out what happened, and before you know it, accusations are flying all over the place. Obviously the werewolf player(s) is going to be bluffing to avoid discovery, and attempt to blend in with the villager players, as well as cast some doubt to the exact role of the other villagers. A simple hint or suggestion can sway the opinion completely of the Villager team, players start second-guessing everything. You’ll start to wonder if anybody can really be trusted? Probably not, because even as an honest member of the Villager team, nothing is as it seems. At the end you could find that the role you had, could have been taken away, and you are now on a completely different team. It’s another title where I find that the randomness and chaos factor really works for the better of the game. The post-mortem after each round is also an amazing experience, as the real story comes out, and you discover the twists and turns taken on the way to the the round conclusion. The app is a great addition to the game, and packs a surprising amount of features. Background music, narrator voice, timing settings – all can be set. 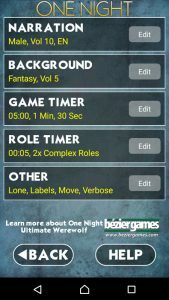 For each round you choose which roles are involved, and you can combine roles from any of the other titles in the One Night series. The narrator voices are clear, and instructions are easy to understand. Additionally the background music does a decent job of covering up any shuffling noises you might hear when other players move or view role cards. Oh, did I mention the app is free? Though it has to be mentioned that in a game of this nature, you will also experience bad rounds. Well, not necessarily ‘bad’, but rounds that are over in seconds as a Seer merely identifies a Werewolf immediately, and that player can’t offer any defence (though, a very good Werewolf could potentially bluff his way out of the situation). Though, those kinds of experiences are then negated by amazing rounds such as where the Werewolf player immediately stated that he was the Seer (great move because there was no actual Seer), and correctly guessed the role of another player, the odds of that happening were 1/8 – I’ve seen it happen. The game is fantastic, but it really shines in the right group of people. A group of close friends where the smallest remarks or a case of mild confusion (like two players mistakenly thinking they have the same role) results in raucous laughter. Also, as an introductory tool to the social bluffing genre, I far prefer this over The Resistance because it’s quick to set up, less complex but just (if not more) entertaining, and just flows so quickly. Also, you can combine the roles from other One Night games (ONUW: Daybreak, One Night Ultimate Vampire etc) to create a different experience. Quick to explain and learn, the setup is almost non-existent, and there is so much variety in the box. Ultimately the group you play with will determine the amount of fun you get out of the game, but I can't recommend this enough. My favourite social bluffing / deduction game by far.